An interview with me was published by Yellowtrace today. I talk about Hanjo, and how the pictures were created. Berlin based fine art photographer, Yoram Roth, takes a strong conceptual approach with his multilayered and visually arresting work. His style extends beyond the fleeting nature of spontaneous snapshots – his images require conscious planning, conceptual development and careful orchestration of a number of elements that play a significant role in his image making. Recently picked up by the respected GALERIE CAMERA WORK in Berlin, Roth will soon be exhibiting his work at several upcoming art fairs throughout Europe and Australasia, including Tokyo Photo (27th – 30th September) where he will present his highly exclusive limited edition photo book. And you’ve seen it here first. The story isn’t mine, it’s a 15th Century Nôh play that was one of several adapted by Yukio Mishima in the 1950s. But I fell in love with the characters, and wanted to retell it as a photographic novel. Everything other than the story was conceived by me. I was really into Japanese culture for a while, not so much the modern Anime stuff, but the whole concept of the Floating World. 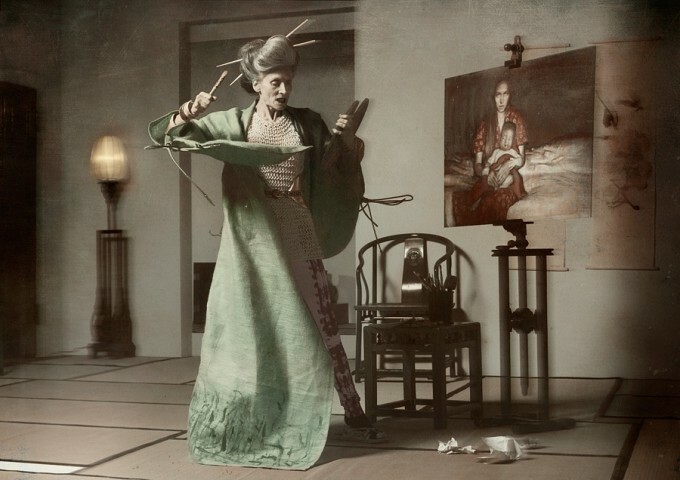 I was fascinated by hand-colored photography, and looking at the Meiji era reveals that transition between feudal, traditional Japan and the modern world. I wanted to capture that in Hanjo. They live traditional lives: Hanako is a geisha and Jitsuko is a painter. but modern elements such as the train station or a newspaper drive the story. I like the idea that media can interrupt a perfectly arranged life. It becomes the Deus ex Machina. Nothing. I’m pretty unsentimental when it comes to objects. I had a watch that I treasured but it was lost. If anything, I’m like a child because I really like new things, especially gadgets and camera gear. Beyond that I prefer my memories, and the people in my life. That isn’t supposed to sound greeting-card corny, I’m just really happy with the people around me. I have great friends, and it’s the time with them that matters most. I really love endless wine-fueled dinners with people willing to talk about art, life, or those endless spiralling conversations that happen with people who are intelligent and aware. I put substantial effort into maintaining friendships made throughout life, in all the places I’ve lived, and am quite proud of this extended family I’ve been able to build. … am a pretty decent cook.